A unique venue for high quality innovative art in public spaces. 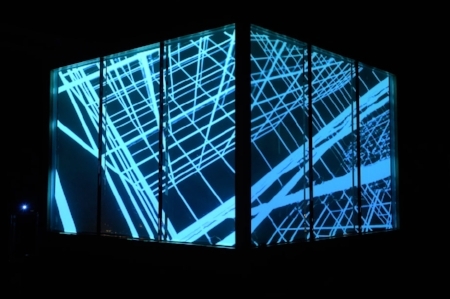 THE CUBE is a freestanding, demountable 4x4m transparent performance venue created by designer David Murphy for public spaces. This purpose built venue can be a home to visual art, performance and film/ project art. If you are a festival programer or event manager this a space for concept to manifest. Dimensions: 3.8m (l ) x 3.8 m (w) and 3.8 m (h). Engineering certificate : Designed to withstand wind rating 50 km per hour. Certificate provided on request. Design: The structure is an internal steel frame that is clad in furniture grade Australian plywood with a floor/stage about one metre off the ground and its four sides made of transparent polycarbonate sheeting. Skillfully designed to contain all production elements within it’s structure. Comes with sophisticated flexible lighting designed by Bruce Ramus, that is operated via a wifi interface. Sound equipment is housed underneath the floor and is integrated within same lighting wifi interface for easy operation. The CUBE is fitted with remotely operated blinds that allow the internal space to be obscured from the view of the public during the day or night. Because these blinds are set just behind the line of the lighting strips, closing them and turning the lights on turns the blinds into dynamic illuminated canvases. This type of blind will also work as a rear projection screen for video or film projector which gives THE CUBE the potential of being a boutique cinema in the round, greatly adding to the programming possibilities at festivals and events. Designed to withstand weather demands including removable polycarbonate wall panels and capacity for a cooling system to be contained within its raised floor.